Few things about your home are more satisfying than relaxing or hosting on your porch, patio, or yard when the weather permits. 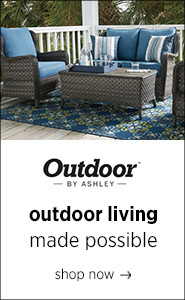 With All Brands’ quality outdoor furniture pieces and sets, get the most use out of these special places at a fraction of the cost you were expecting. Choose from a variety of informal contemporary looks from wicker-look sectional sofas and other outdoor seating with solid aluminum frame construction so they can withstand summer’s gusts, to a perennial favorite, metalwork chairs and chaise lounges perfect for poolside reading and tanning. If you and your guests seek shade, one of our giant cantilever umbrellas gives you pavilion-like coverage. And when the temperature drops so there’s a nip in the autumn air, keep the outdoor party going with a beautiful outdoor fire pit or heaters. When a lovely day or evening adds to a celebration with family and friends or simply to your enjoyment of a well-prepared dinner, maybe even from the grill, make the most of it with one of our outdoor dining sets! 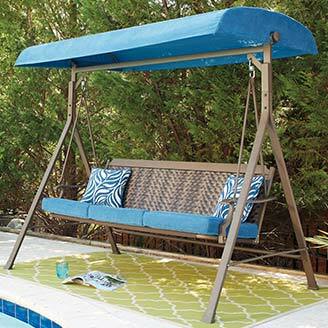 Our sturdy selections are made tough with rust-resistant aluminum frames and powdercoated finishes. Some of our tables come with a center hole to add an outdoor umbrella to help beat the heat. Another option is latticework tabletops to easily shed rainwater. Seat up to 7 guests handily with our finely designed, amply cushioned chairs including swivel models, or benches, a favorite of restless youngsters eager to get back to playing. You can also be the ideal host serving drinks right away at one of our outdoor bar sets. With All Brands’ selection of outdoor fire pits in a variety of shapes and finishes, extend your patio entertaining into early spring and late fall with style and confidence. Adjustable propane flames are as easy as turning a knob. Enjoy a wood look if you prefer, without splintering due to the elements and dryness. Our fire pits also come with plenty of edge table space on which to place your plates and glasses. Stop by any of All Brands’ New Jerseyfurniture showrooms such as our Perth Amboy, NJ store to get started on making your next summer of outdoor parties the best!